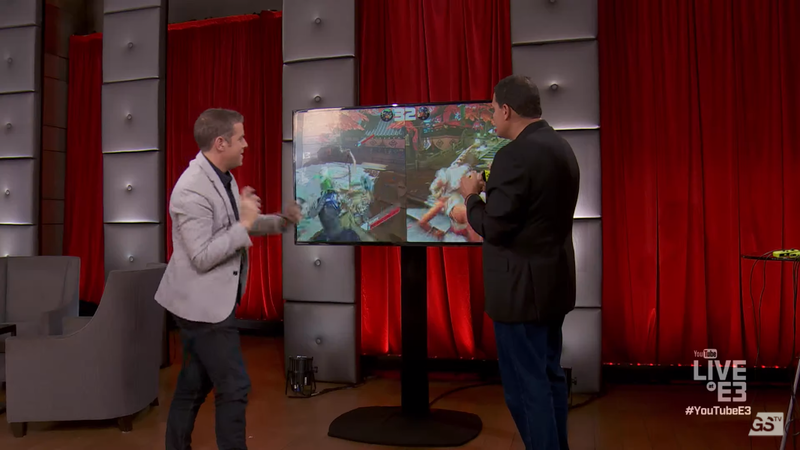 KoopaTV: Reggie Fils-Aimé vs. Geoff Keighley: ARMS! By LUDWIG VON KOOPA - Live @ E3, Keighley waggling! Here I thought we were just watching this, but apparently this was for publishing. 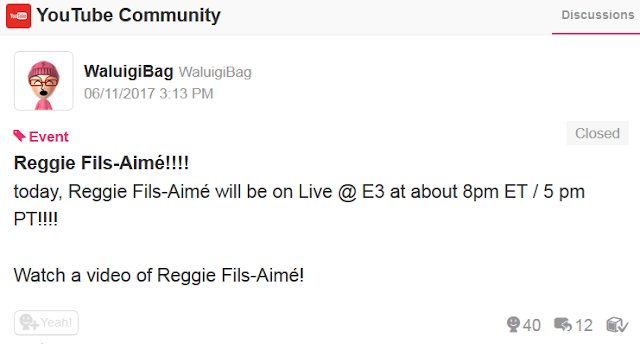 Shout-outs to WaluigiBag for letting us know that this would even be happening. 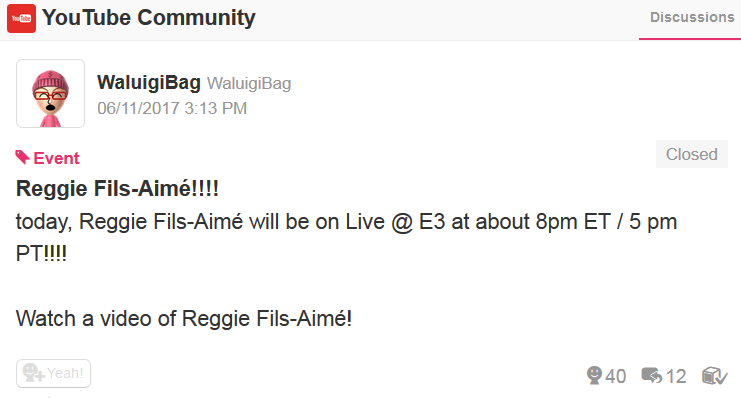 President of Nintendo of America Reggie Fils-Aimé was on Geoff Keighley's YouTube E3 stream thing to talk a little bit about how E3 Weeks 2017 was going for him. Then they fought in ARMS. (7:57:46 PM) (rawkhawk2010) Freeza was brought back to life last night. (7:58:34 PM) Ludwig Von Koopa: Wot's HDR? (7:58:53 PM) (rawkhawk2010) high definition resolution? (8:01:18 PM) (rawkhawk2010) the new doritos? (8:01:36 PM) Ludwig Von Koopa: Waiting for many years. (8:01:39 PM) Ludwig Von Koopa: Reggie. (8:01:45 PM) Ludwig Von Koopa: ARMS shirt. (8:02:05 PM) Ludwig Von Koopa: "For YOU Jeff, it's all ARMS." (8:02:45 PM) (breezinabout@msn.com) "Lots of love for 3DS". (8:02:46 PM) Ludwig Von Koopa: Continue momentum for 3DS. (8:02:50 PM) (rawkhawk2010) ...25 minutes? (8:02:50 PM) Ludwig Von Koopa: Spotlight is 25 minute kickoff. (8:02:54 PM) (rawkhawk2010) I thought it was 30! (8:02:55 PM) Ludwig Von Koopa: Fast and to the point. (8:02:58 PM) Ludwig Von Koopa: Guess not! (8:02:58 PM) (rawkhawk2010) It keeps going down. (8:03:14 PM) Ludwig Von Koopa: First hour of Treehouse Live has breaking news. (8:03:27 PM) (rawkhawk2010) Is that an ARMS pin or an ARMS-branded blazer? (8:03:40 PM) Ludwig Von Koopa: Reggie didn't watch the conference. (8:05:09 PM) Ludwig Von Koopa: "The very first battle we did was at GDC"
(8:05:15 PM) Ludwig Von Koopa: "No, you're remembering wrong. It was at E3"
(8:05:20 PM) Ludwig Von Koopa: Reggie-Keighley interactions. (8:05:22 PM) (rawkhawk2010) Reggie reminds me of Obama. (8:05:33 PM) Ludwig Von Koopa: Is that a bad thing? (8:05:39 PM) Ludwig Von Koopa: "Don't be a John." (8:06:17 PM) Ludwig Von Koopa: "This is NOT waggle control." (8:06:20 PM) Ludwig Von Koopa: Keighley smiling. (8:06:38 PM) Ludwig Von Koopa: Testpunch reaction fantastic across the globe. (8:06:43 PM) (rawkhawk2010) Not from KoopaTV! (8:06:50 PM) Ludwig Von Koopa: You never published your reaction! (8:06:53 PM) Ludwig Von Koopa: How would Reggie know? (8:07:23 PM) Ludwig Von Koopa: Reggie john-ing about how Hungrybox rekt him. (8:07:51 PM) (rawkhawk2010) why are they standing on opposite sides from their characters? (8:07:56 PM) (rawkhawk2010) Reggie should be on the left. (8:08:16 PM) (rawkhawk2010) or is this how you're supposed to do it? (8:08:20 PM) Ludwig Von Koopa: So Keighley is Twintelle? (8:08:31 PM) Ludwig Von Koopa: "kiddo"
It's proper tournament organising to have contestants on the side of their characters. (8:10:23 PM) Ludwig Von Koopa: He's winning. (8:10:38 PM) Ludwig Von Koopa: Keighley is predictable. (8:10:44 PM) Ludwig Von Koopa: Reggie is bait-and-punishing him. (8:11:24 PM) Ludwig Von Koopa: How come Reggie doesn't get the specials? (8:13:45 PM) Ludwig Von Koopa: Reggie gone. Okay... the next article after this will be an actual E3 conference. But, just be warned: KoopaTV is unpredictable and may publish things at any time, so constantly be checking back to www.KoopaTV.org for new content! 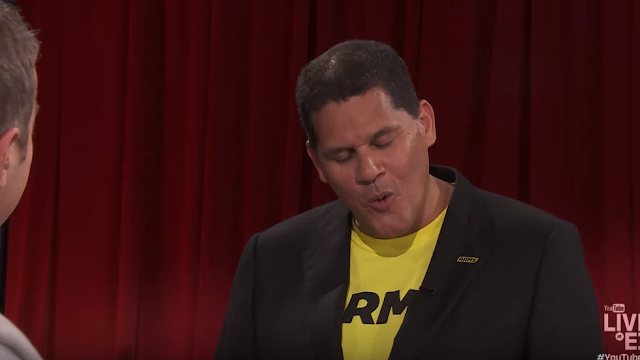 View KoopaTV's live reaction log of the Nintendo World Championships 2015 here, where Hungrybox destroyed Reggie! While Reggie didn't watch the Microsoft E3 2017 conference, KoopaTV did! You can read our live reactions to it here. Here's the actual E3 conference after, from Bethesda. We don't blame Keighley for being punishable and waggling. ARMS does not feel good to control.